Learn how to grow and care for pittosporum plants. Growing pittosporums is easy. 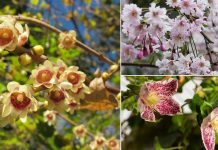 In addition to their exotic scented flowers, their beautiful foliage and fast-growing ability make them wonderful plants for hedges and borders. Pittosporum is a genus of about 200 species of flowering shrubs and plants. Majority of these species are native to Japan and Southeast Asia, although several of them have been identified in Africa. The leaves of a Pittosporum plant are usually spiral or whorls. Most pittosporums do not exceed 2 – 3 meters in height after several years of steady growth. Growing pittosporum also allows enjoying its foliage, renowned for its beauty. Other Names–Karo, Stiffleaf Cheesewood, Kaikaro, Kīhihi, Kōhūhū, Black Matipo, Kohukohu, Tawhiwhi, Japanese pittosporum, Japanese mock-orange, Australian laurel, and Japanese cheesewood. Pittosporums are evergreen plants that can be grown as a shrub or small tree. Pittosporum leaves are leathery, oval, alternate, bright, dark green in the light and become lighter on the underside, with veins more or less evident depending on the variety. Flowers are white, cream, yellow, red or brown, this too depends on the variety. These flowers are scented, emanating pleasant citrus-like fragrance. You can propagate pittosporum plant by seed, but growing pittosporum from cuttings is relatively easy and better. Our advice is to buy a plant from a nursery. 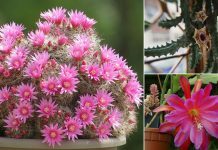 For this, take several cuttings of about 8 – 15 cm and plant them in a pot filled with starting mix. You can also dip them in rooting hormone before planting. Place the cuttings on a bright spot and keep the soil moist. Once new leaves appear after a few weeks slowly acclimate them and when they have outgrown their existing pot transplant them to a bigger pot or on the ground. If your soil is heavy, dig a hole large enough (one meter in all directions) and mix 1/3 coarse sand, 1/3 compost and slow release fertilizer in it. For planting in a pot using good quality light potting mix is optimal. For a hedge, grow medium-sized varieties and space them about 1 m apart. Carefully take out the plant from the pot without damaging the roots. Remove some soil around rootball gently and plant it at the same depth as it was grown previously. Water the plant thoroughly and regularly until it establishes. Pittosporum plant is not difficult to grow. It is fast growing and decorative. 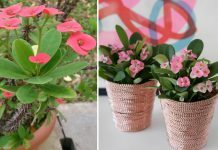 You can also plant it on your balcony or patio garden in a container. Pittosporums are fundamentally outdoor plants but can also be grown at home in the partial sun. 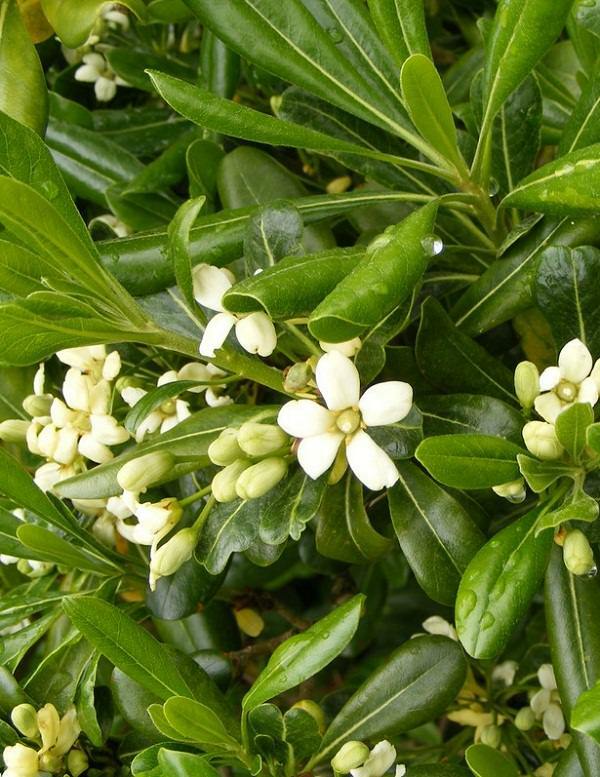 Plant Pittosporum outside near a sheltered position so that it is not subjected to warm and cold currents or wind. Keep the soil slightly moist. From the spring and all summer long water abundantly but wait for the soil to dry out between watering spells. Reduce watering in winter. When water, remember that pittosporum plant tolerates drought better than excessive irrigation, so avoid overwatering. Soil should be well drained, loamy and slightly acidic to neutral. Pittosporum care is simple, but if you’re growing it in a cooler zone, you should know its minimum temperature tolerance is variable, depending on the cultivar you’re growing. Feed the plant with a balanced slow-release fertilizer in spring. Follow label directions for dosage rates to avoid over fertilization. Mulching the plant in spring with composted leaves or aged manure is also beneficial. Pittosporum plant requires regular light trimming and pruning to keep it in shape, size, and appearance. Use sharp scissors to cut off damaged, dying or diseased branches from the bush. If you want to do heavy pruning do when its blooming period ends. No serious disease affects pittosporum plants but regularly inspect for pests like aphids, red spider mite, cushion scale, and pittosporum suckers.